As the Dead Sea scrolls have changed our understanding of Judaism and early Christianity, so a set of twenty-nine scrolls recently acquired by the British Library promise to provide a window into a crucial phase of the history of Buddhism in India. The fragmentary birch bark scrolls, which were found inside one of a set of inscribed clay pots, are written in the Gandhari Prakrit language and in Kharosthi script. Dating from around the beginning of the Christian era, the scrolls are probably the oldest Buddhist manuscripts ever discovered. 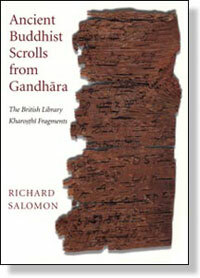 This volume introduces a project to decipher and interpret the Gandharan texts. It provides a detailed description of the manuscripts and a survey of their contents, along with a preliminary evaluation of their significance. Also included are representative samples of texts and translations. Ancient Buddhist Scrolls from Gandhara will appeal to a broad audience with interests in Buddhism, comparative religion, and Asian languages.